Based on reviews from 8 experts and 2,362 users. Learn how our rankings work or see our guide to gold football boots. Updated Apr 2019. For some people, seeing something gold or even just hearing the word gold reminds them of success, elegance, wealth, power, and abundance. It is the color of the sun and is a cousin of the colors yellow and brown. It can be bright and vibrant; it can also be somber and traditional. In whatever culture, country, and market, the color gold has always been associated with prestige. In the football arena, when a player wears a gold football boot, he is said to be super talented and confident. Football boot manufacturers such as Adidas, Nike, and Puma have created special edition gold football boots for these kinds of players. Below are some of the best gold football boots from these famous brands. As part of their limited collection Space Craft Pack, Adidas launched only 1,000 pairs of the Adidas X16+ Purechaos and the Adidas Ace 16+ Purecontrol in gold. The striking gold and black aesthetic of this particular pack represents the reflectiveness of a spacecraft material against the darkness of space. What makes this football boot pack even more special aside from its gold exterior is its cushioned kangaroo leather vamp. The polished gold midfoot creates a nice contrast against the rustic, matte gold forefoot. Techwise, the Adidas X16+ Purechaos has the trademark one-piece Dynamic TechFit compression upper. The only difference from a regular Adidas X16+ football boot is the K-leather panel found in the forefoot. The synthetic part of this gold football boot has a snakeskin-like texture. The SprintFrame construction together with the external heel counter is finished in metallic gold. The FG/AG stud pattern of this gold football boot is similar in function to the ones you can find in the Adidas Messi and Adidas Ace silos. 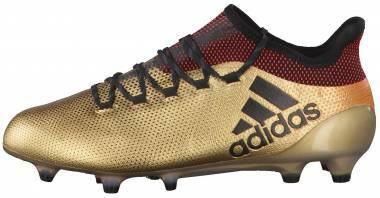 Similar to its X16+ counterpart, this laceless gold football boot has a soft leather vamp. The midfoot and rear areas of this gold football boot are made out of reinforced Primeknit with NSG applied all over. The top of the upper has the exposed Primeknit material in black. 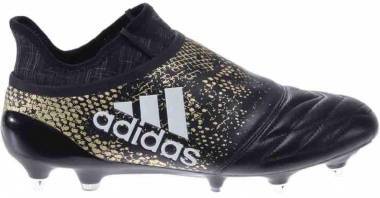 The Three Stripe logo on the lateral side does not only add to the stylish design of this gold football boot, but it also acts as a reinforcement to the otherwise elastic Primeknit material. The flexible soleplate of this soccer shoe comes in a shiny metallic gold finish. The conical studs also have a gold base but with translucent black tips. This interesting gold football boot was inspired by the Neymar Jr.’s story about how he used to spray paint his football boot gold when he was 12 years old. Nike worked closely with the renowned Brazil striker to mimic the right shade of gold and get the perfect spray-painted look. The official color of this gold football boot is called Metallic Gold Coin because it indeed looks like a shiny new gold coin. The reflective gold upper looks like it was made out of an actual gold bar, making it stand out from the other gold football boots on the market. From the outside, this gold football boot features a bright yellow Nike Swoosh with a black accent in the heel and toe areas. The right sock liner has the phrase Sonho Dourado, which is Portuguese for golden dream; while the left sock liner has the Hypervenom graphic with a spray can next to it. The glass nylon soleplate of this gold football boot comes in Volt yellow with a small black Nike Swoosh in the midfoot. The studs underneath have the Volt yellow base with translucent tips. The stud layout is similar to what you can find in the Nike Mercurial football boots. When it comes to performance, this gold football boot, though labeled as Premium, is pretty much the same as the regular Nike Hypervenom Phantom football boot. Nike also has takedown models of this gold football boot, namely the Nike Hypervenom Phelon Premium, Nike Hypervenom Phatal Premium, and the Nike Hypervenom Phelon Premium. As a tribute to Argentinian striker Sergio Agüero’s being the all-time top goalscorer in Manchester City’s history, Puma released the limited edition Puma One 17.1 FG Gold. While the original Puma One 17.1 version comes in a leather upper, both the Puma One 17.1 Gold and Puma One Chrome 17.1 feature a synthetic upper with gold and chrome finish respectively. The upper of this 7.2-ounce gold football boot is made of a thin and lightweight synthetic upper. There are small touches of black on the upper including the Puma Formstripe outline, the Puma One logo, the Puma cat logo, and three nylon straps. The soleplate and studs of the Puma One Gold have a metallic gold finish. It features the FG/AG stud pattern. Aside from the all-gold football boots from Adidas, Nike, and Puma, there are also plenty of football boots from Under Armour, Lotto, and New Balance that have gold accents. Below is a short list of some of the soccer cleats with gold accents. The entire upper of this New Balance football boot is covered in metallic silver except for the black N logo and Visaro branding. The gold accent can be found when you flip the football boot. All 13 studs including a small area under the forefoot are in gold. In honor of Memphis Depay, an Under Armour football boot was launched in black and gold in June 2015. The classic black upper design of this Under Armour Speedform football boot is retained while adding a touch of gold on the soleplate and external heel counter. Does the soleplate finish of these gold football boots last? The soleplate finish of these gold football boots, such as the Adidas Ace 16+ Purecontrol and Adidas X16+ Purechaos, come with a warning sticker that they will wear off with continued use. Are there gold football boots for playing surfaces other than firm ground? While the above mentioned gold football boots are for mostly firm ground (FG) surfaces, there are also gold football boots for other playing surfaces. For soft ground (SG), there are the Adidas Ace 17.1 Soft Ground-Gold and Puma King XL Soft Ground. For artificial grass (AG), there is the Nike Mercurial Vapor IX Artificial Grass in the Gold/Black/Red colorway. For turf fields (TF), there are the Adidas X Tango 17.3 and the Nike Mercurial Finale Turf in the Metallic Gold/Black/Red/White colorway. For indoor courts (IC), there is the Nike Mercurial X Proximo Street Indoor.